Movies, television shows, and the media as a whole can certainly influence the way we perceive certain things — often without us even knowing it. The way many people view the profession of private security is certainly no exception to this, which is why here at Reveles Intelligence, our team of Top Rated Local® San Antonio security providers want to provide some clarity on what our security services actually entail. When many people think about security guards, their minds likely go in one of two directions: either the stereotype of the incompetent “mall cop,” or the portrayal of the super slick spy security that takes on an entire circle of criminals or walks away from explosions without the slightest flinch. Another common perspective is that security guards are only hired for bars and clubs to prevent brawls and kick people out that become overly inebriated. The truth is, security guards are hired for protecting a variety of types of premises, from construction sites and corporate offices to private communities, events, and more. 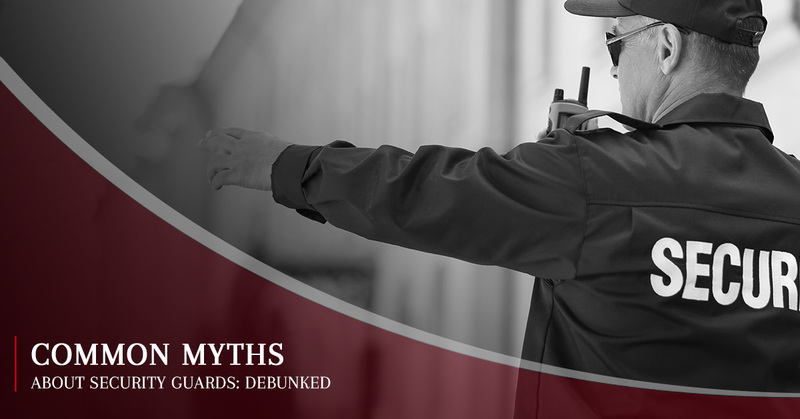 The following are some of the most common misconceptions about professional security guards. While there are certainly security guards out there, particularly the event security companies that hire just about anyone off the street, that are not trained, as long as you choose a reputable security services company, like ours in San Antonio, it’s a safe bet they are properly trained. Members of the Reveles Intelligence Department of Private Security undergo regular field training and educational courses for just about every scenario imaginable. In fact, the vast majority of our security guards have either veteran military or law enforcement experience. In actuality, private security services involve many other factors besides simply deterring crime. Your security guards are your first responders in the event of an emergency and also can provide overall assistance in ensuring your business or event continues to run smoothly. Of course, the exciting dealings with crime are the only aspect of private security you’ll see on television, but you don’t exactly see surgeons going through stacks of paperwork in your Netflix shows either, do you? Because of many television shows with incompetent security guards being easily fooled by criminals or acting no different then the terrifies civilian next to them, many believe security services aren’t worth the time or money. This couldn’t be further from the truth. While professional security guards are trained to handle crime and bring it to a halt in the event something does occur, they more often serve as a deterrent. This is because the presence of even one security guard often makes criminals think twice about their premeditated plan. The media has also led to people believing private security guards only for the upper class with priceless assets that need protection. While executive protection is a division of private security, most security companies, like ours in San Antonio, offer affordable hourly security services that are within anyone’s reach! In fact, our security personnel can be implemented by most small business owners with benefits that far outweigh the costs. You can even get 10% off our San Antonio security services for a limited time! The reality — and not one of the misconceptions about security services — is that security guards play an important role in ensuring a safe environment for people and property of all types. The presence of security guards provides peace of mind to employees and customers. If you decide that you want to hire security guards in the San Antonio metro area, reach out to our team at Reveles Intelligence today.